Although layoffs on Wall Street rose sharply during November, new hiring also surged to the highest level seen since the 4th Qtr of last year, indicating that Wall Street executives remain cautious about business conditions given tight profit margins, low interest rates, and growing regulatory pressure. According to the Challenger, Gray & Christmas Job Cuts Report, the financial services industry saw planned layoffs surge over 330% in November to 2,030 layoffs – the highest level of layoffs reported since June of this year. The November 2016 layoff figure remained 158% higher than the 784 layoff total reported during the same month last year. Layoffs for the first eleven months of 2016 totaled 21,417 or 7.8% below the total for the same period in 2015. However, the picture was much brighter for job seekers in November as new jobs rocketed 700% higher to 1,600 new positions – the highest level of new jobs on offer since October 2015. New hiring in November was 540% above than the figure seen in the same month in 2015 when 250 jobs were available. Despite the surge in November, new hiring over the first eleven months of the year totaled 5,276 new jobs — 46% below the 9,786 new jobs offered during the same period during 2015. As you can see from the above chart, despite the surge in hiring during November, layoffs remained consistently above hiring, reflecting that employment continues to shrink on Wall Street. 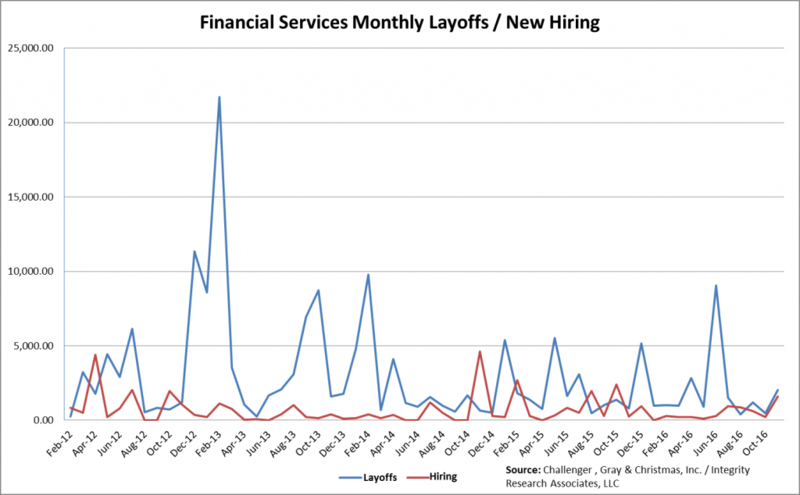 In fact, over the past twenty four months, hiring has eclipsed layoffs only four times – leading to a decrease of 34,018 jobs in the financial services sector during this period. This trend is consistent with our view that Wall Street executives are continuing to shrink their staffs as overall profits remain under pressure. Last month, Boston-based asset manager Putnam Investments announced that it is planning to cut approximately 8% of its total workforce or 115 positions as investors have continued to pull money out of the firm’s actively managed funds. Most of the affected employees are in Putnam’s operations and technology units, though a “small number” are investment professionals. Among those leaving Putnam is the firm’s CIO, Walter Donovan. In addition to the layoffs, Putnam is getting rid of non-core business programs and cutting vendor costs. The firm is planning to reduce expenses by $65 million. During November, Asia-oriented investment bank, Standard Chartered Plc announced that it is planning to cut about 10% of its staff in its corporate and institutional division as part of a plan announced last year to eliminate 15,000 jobs and improve profitability at the bank. The main jobs affected will be in the corporate finance and trade financing departments in Singapore and Hong Kong. The good news for the November jobs outlook was the fact that new hiring surged to the highest level seen since October 2015. Unfortunately, this gain was more than offset by a large increase in layoffs as management remains concerned about the various factors which continue to squeeze bank profits, like weak IPO volume, falling commissions, and low interest rates. These factors, on top of pending regulatory changes, lead us to believe that most sell-side and independent research firms probably won’t be increasing their research teams or sales staff anytime in the near future. In fact, we wonder if these trends could lead to further retrenchment as management tries to find ways to make money from their research franchises during these trying times.